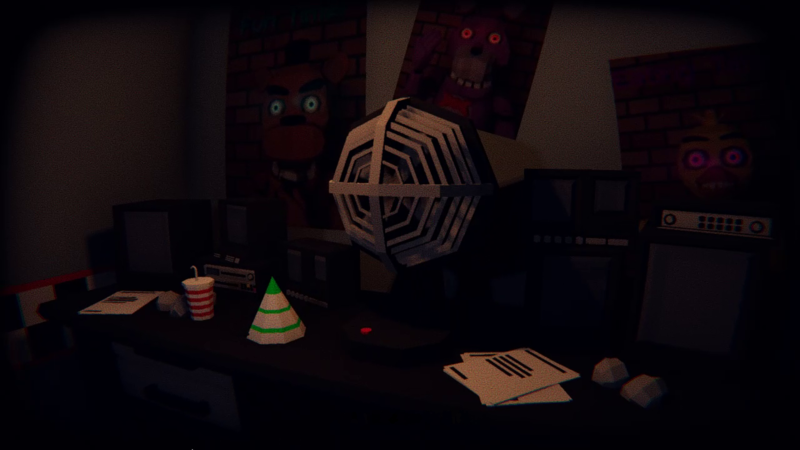 FNAF: Final Purgatory is a randomly generated Five Nights at Freddy's fan game originally created in nine days for ProcJam 2018. Go check out all of the other amazing ProcJam 2018 entries here! Survive the night, lasting from 12 PM to 6 AM. 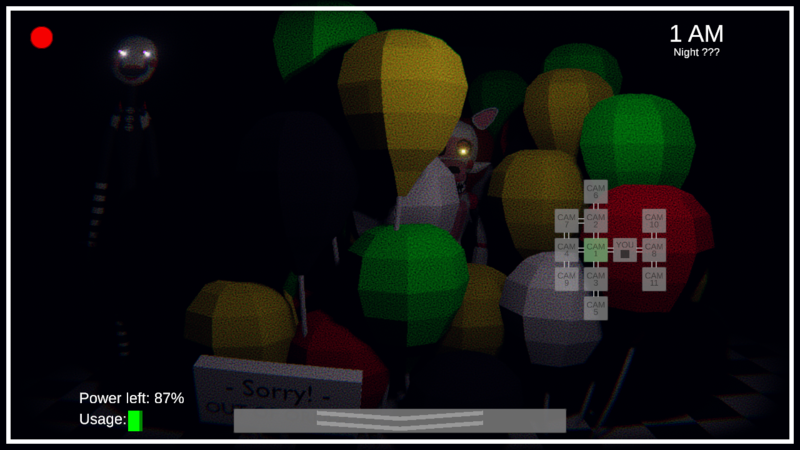 Keep an eye out for animatronics as they roam through the map, waiting to stuff you into a suit if you are not careful! Each pizzeria layout is randomly generated, making every play through unique. FNAF: Final Purgatory is a remake of FNAF: Purgatory, which has been downloaded and played thousands of times since I developed it for ProcJam 2016. For ProcJam 2018, I thought I'd remake the game from the ground up, putting everything I have learned in the two years to make everything better overall. The game can be played in the browser, but if you are having issues, performance is bad, and/or the graphics look terrible, please try the downloadable version! Check out the Game page on RandomMomentania for details like features, upcoming plans, the change log, and known issues! Note: This is a fan game, developed in my spare time. Please support the official Five nights at Freddy's games! I do not claim ownership of any of the Five nights at Freddy's material in this game. 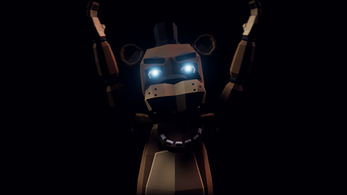 All rights to Five nights at Freddy's belong to Scott Cawthon. material in this game. All rights to Baldi's Basics belong to mystman12 on Itch.IO. This is a free fan game, I don't make any money off it. For more legal information, please download and read README.pdf. Also: This game contains flashing lights, jump scares, and potentially loud noises! 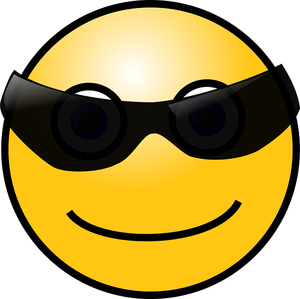 This game may cause issues to people with Photosensitive epilepsy, or similar conditions. If you are on Windows, you'll need to download the proper version for your computer. 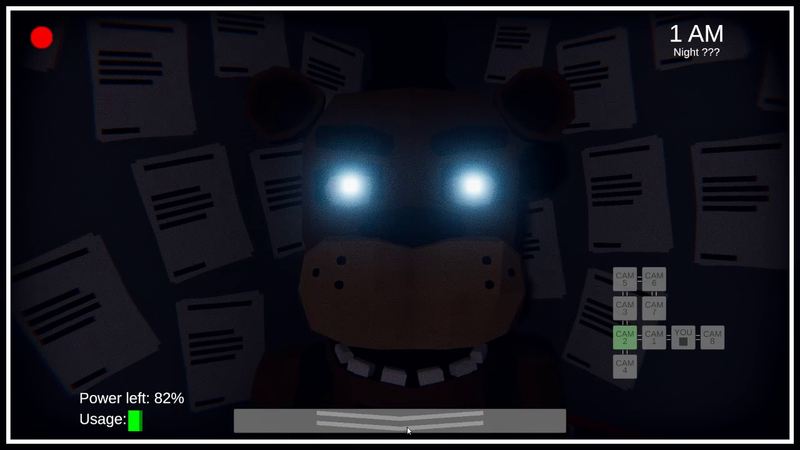 For most users, this should be FNAF_Final_Purgatory_Windows_64bits.zip. Only the Windows version has been tested. If you find any bugs in the Linux or MacOS versions, please let me know so I can fix them! Thanks! The Android version of the game is unofficial and requires Android 4.1. I would suggest trying the gamma version of FNAF:Final Purgatory on Android if the normal version does not work. Please note that unofficial builds are not guaranteed to work, nor will they receive bug fixes beyond those that the official builds receive. I hate scary games, but I love this scary game. Double thumbs up! my brightness is also all the way up. Can you please brighten the office i can't see the door or light button. Thx!!! Hey SANSTHEPUNNY. Sorry to hear that the office is too dark. I may be able to fix the problem, but I need to know a few more things so I can better determine what the issue is. If possible, can you take a screenshot of the game and post it either in a reply here, or on a platform like Imgur? That way I can take a look and see if it is a shader/graphics conflict with the game. What platform are you running the game on? Are you running the game on desktop (Windows, MacOS, Linux), web (WebGL), or Mobile (Android). If you are running the game on Android, are you running the gamma version or the normal version? Have you tried the gamma version? If you are not running the game on Android, have you tried the legacy effects? The legacy effects are slightly brighter overall, so maybe that will help. Anyway, to answer your question, yes and no. I think I have discovered what the problem is, and I think I have found a way to replicate the problem on the official Android emulator. The problem appears to be the Android devices that are not working do not support the full OpenGL ES 3.0 spec. This is a bit of a problem because I am using a linear color space in Unity so the post process effects work correctly, which requires OpenGL ES 3.0. I can compile for OpenGL ES 2.0, which should fix the problem, but I have to switch to gamma color space, meaning not only do the post process effects not work correctly, but also the game is very dark and hard to play. Maybe add a few easter eggs like being able to boop freddys nose on the poster and get a honk sound? Sounds fun dont it. Can you possibly rework the jumpscares? Also the settings do not work for me. It only shows 2-3 at a time even though all characters are selected. I can probably rework the jump scares. Anything in particular you feel is missing from them? I know they are not terribly scary, but if there is anything else you feel is missing I'll try to take that into consideration. As far as the options not working, did you change the minimum and maximum animatronic count? By default the game is set to only spawn 1-3 animations at a time, but you can override this by setting the the minimum and maximum animatronic count to a higher value. 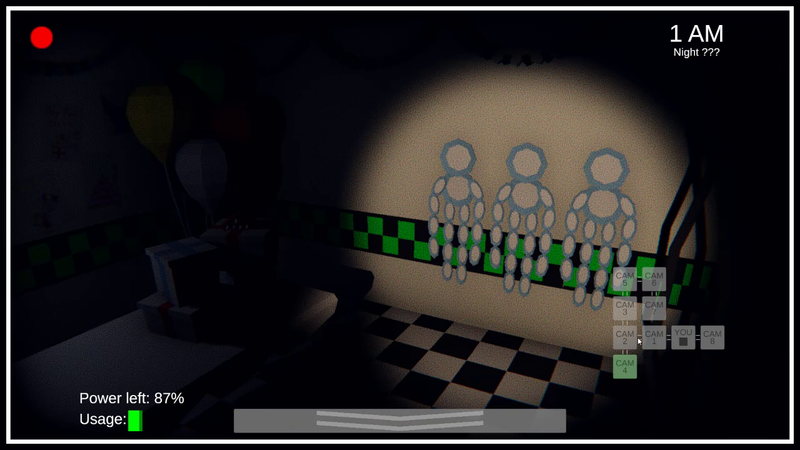 You can also force it to spawn all animatronics by enabling the "No duplicate animatronics" option and setting the minimum and maximum to something like 20. 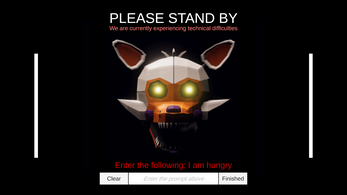 That should spawn all of the animatronics. Ok Ill try it. 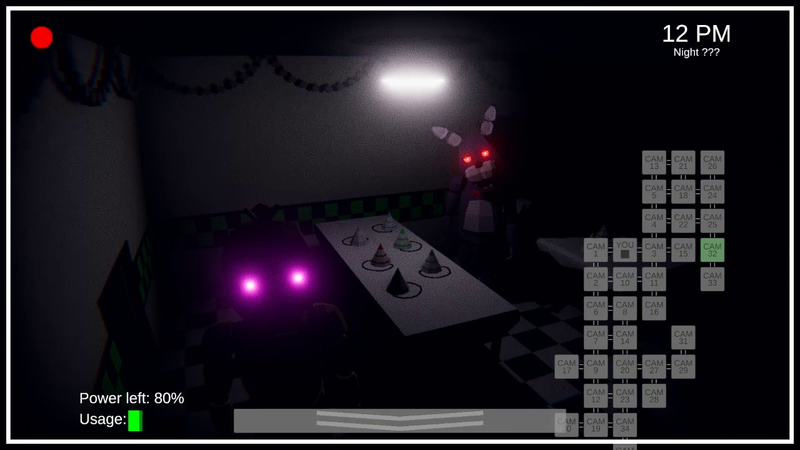 As for the jumpscares, I might have the animations play faster than current and have them tackle or their faces are "pouncing" close to the screen kind of like the jumpscares in FNaF 2 and 4. Just a thought for a more intense experience. It makes me want to stay alive, so I dont get scared. Let me know if this makes sense. That's what I mean. I Appreciate you for listening. I love this game. 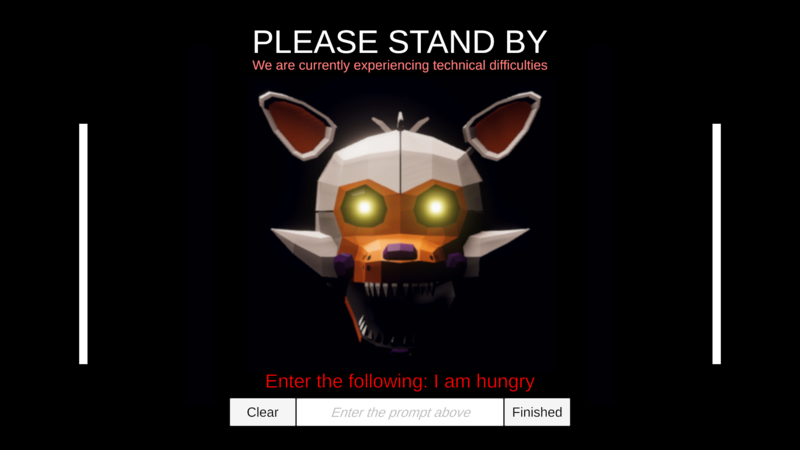 Probably the best browser based FNaF game; never seen a good 3D FNaF for the web (p.s. I also found out how to adjust the settings, thanks). Thanks jts0329, I really appreciate the feedback and compliment! I am glad you are enjoying the game, and I will do my best to keep working on it and make it even more fun and fully featured. Phantom Animatronics: They either A.randomly show up on the cameras and force the player to change to another or pull it down, B.appear in either door blindspot, and if the player sees them in the light, quickly turn off the door light, or C.appear directly in the office, making the player have to pull up the camera to avoid them. If the player fails to do any of these, they will jumpscare the player and temporarily make the cameras unusable. Thanks for the suggestions supernewtonbros! I appreciate it! 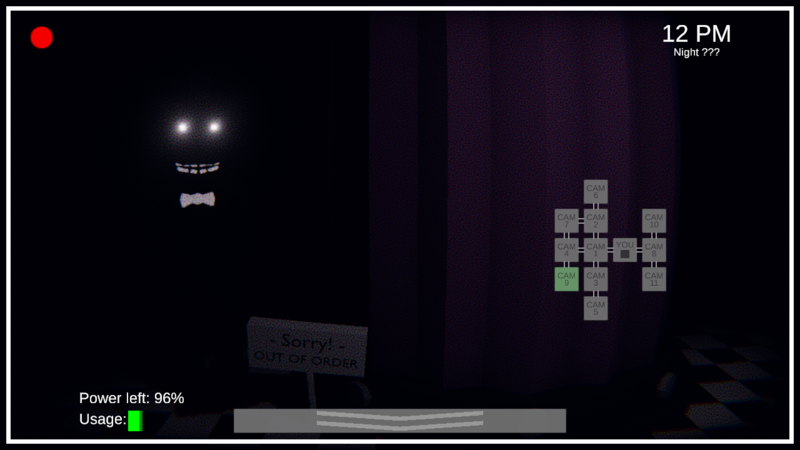 I'll add adding Phantom animatronics to the list of things to add in a future update. I think the ideas are good, I'll just need to prototype and test them to see which works best with the game play and with the code base. While I cannot guarantee they will be added, I certainly do not mind giving it a short and seeing where it goes.